Facebook has approximately 2 billion monthly users and is one of the world’s most popular social marketing platform. But the thing is, you have to craft a Facebook marketing strategy that stands out among 50 million other businesses on Facebook. With almost every business owns a Facebook page these days, how can you take your Facebook marketing to the next level? 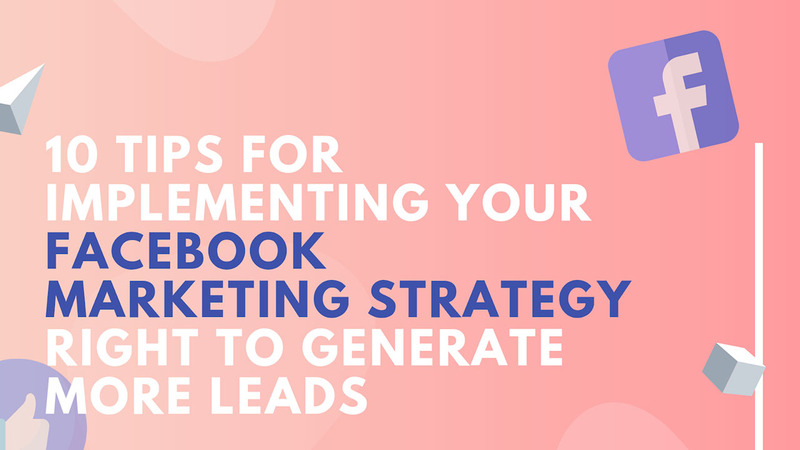 In this article, we’re going to talk about how you’re going to supercharge your Facebook marketing strategy to generate more leads, and eventually ‒ sales. If you have a business page thriving on the platform, then you might consider utilizing your logo (or a shortened version of your logo) on your profile photo. Over time, this can help boost your brand recognition and ensure that everyone who lands on your page will be introduced to your logo. If you own a business that’s more personal, for instance, you’re a life coach, a travel photographer, or an influencer then you might want to consider using your headshot as your profile picture. The reason behind it is that you’re selling yourself on Facebook so be sure that you make necessary introductions about yourself and what you do. It’s because, when someone finds your business profile on Facebook, your profile picture is one of the first things that they will notice and will associate your brand with. That’s why it’s crucial to utilize whatever represents your brand well and would put you more into a more positive light. Nutella’s cover photo is setting a scene. Maybe, you were in a hurry to put something up, that you took out a stock image closely related to your business, or picked something that seemed generic but ultimately irrelevant. Unlike what others think, your cover photo does matter, and you should take the time and effort to make one that that effectively communicates what your business is all about. Your cover photo is another opportunity to come up with a vital piece of imagery that can potentially blow your audience away. It serves as an excellent branding opportunity, giving you the chance to show your audience what you do. Moreover, keep in mind that Facebook’s cover photo dimensions continuously change, so always keep an eye out with the official guidelines. As of now, the sizes for cover photos on computers are 820×312 pixels, and 640×360 pixels for smartphones. For you to generate a substantial online presence, visual content is pretty much a requirement. Do you know that visuals are 40x likely to get shared on social media? While photos do a great job to capture the moments, as well as the overall look for your brand, you should also invest significant time and effort on video. So what type of videos will you be making? Is it pre-recorded or live ones? According to Facebook’s newsroom, people are 3x likely to watch a video is it’s live rather than pre-recorded ones. Live videos give your followers an in-the-moment-look of what your organization is all about. Just see to it that you come well-prepared. Call-to-action buttons or CTAs are an excellent way to help you drive more traffic to your site, and for you to get more eyeballs on the content that you promote. It’s one of the most effective ways to drive traffic from your Facebook Business Page and back to your site. CTAs like “Sign Up, “Watch Video,” or “Book Now” can be customized with a destination URL or a particular content that you choose. One of the most crucial aspects of your Facebook content strategy are the frequencies of your posts ‒ how often, and when. If you don’t post regularly, you won’t come off as reliable and authentic to your audience. Think about it ‒ would you put your faith into a particular brand who hadn’t updated their Facebook page for months? Of course, not. Just remember not to post too often though. Otherwise, you will flood your audience’s feeds with your content. The highest click-through rates (the number of users that click through your ads and posts) on average, are between 1 to 4 pm. Usually, this peaks at Wednesdays at around 3 pm. The worst times to post are on weekends, usually before 8 am, and after 8 pm. Adding visuals on your posts boosts engagement, doubling the number of likes and comments. As of the moment, Facebook Live is getting more views than regular posts. Now that you already filled your page with content, it’s time to promote it. Then, from there, the platform will help you create an ad from scratch (usually based on your goals.) Do you want to broaden your reach, increase your traffic, or create general brand awareness? Moreover, you can also select your target audience, your budget, and where you would want Facebook to place your ads. Keep in mind that you’re paying for this, so select something that has the power to captivate your audience’s attention. Choose something that’s high-quality and represents your brand well. Creating Facebook content is a great way to build brand awareness. Do it the right direction, and you’ll walk away with more likes, comments, and engagement. Consider the prize of your giveaway or contest as part of your marketing campaign. Moreover, contests also help you reach your follower’s friends and family, helping you broaden your reach. One of the most effective ways to stand out from the pack is providing the best customer care for your customers. Usually, people have high expectations and would expect a brand to respond to their questions and queries right away. In social media, the average customer expects a brand to respond within 4 hours. So don’t ignore your comments section. Put in the effort to respond to questions and notifications rather than sleeping on them. You’re showing that you value your customers’ time, and could make a difference whether or not you’re losing a prospect for good. Facebook Insights is one of the most effective Facebook marketing analytics tools out there. Insights will help you understand various data points such as likes, reach, engagement and demographics. It also helps you understand how well your content is resonating with your audience, how your page is growing and will provide you with an extensive overview of how your Facebook strategy is currently performing. Moreover, it allows you to tailor your posts so that you know you’re providing the right content, the right voice, and publishing posts at the right time. You’ll also gain access to vital information about your audiences such as their gender, age, job titles, interests, and relationship status. Creating an effective Facebook strategy isn’t as easy as you think. You can’t just slap in a couple of photos, and texts, and expect that the leads and customers roll in. Your Facebook page needs to have a comprehensive strategy that will help you get noticed, liked, and engaged with by your followers. It also increases your chances of generating leads and sales in the long run. Kevin Urrutia is the founder of Voy Media, a Facebook advertising company based in New York. He helps businesses maximize the benefits of Facebook Ads, leading to a dramatic improvement in sales while pushing down costs. Voy Media thoroughly studies each client and comes up with tailor-fit solutions to bring about the best results.